If you have been reading this blog for a while, you will know that I adore making desserts of every kind. Cakes? Cookies? Cupcakes? Check, check and check. Want to make candy? We’ve got you covered there too. (Teaser: stay tuned for another candy recipe coming up soon!) And of course, my chocolate category is kinda overloaded. And I know that people love my dessert treats, so I keep baking them. But I get such overwhelmingly positive feedback on real food recipes, that I can’t neglect that aspect of this blog either. 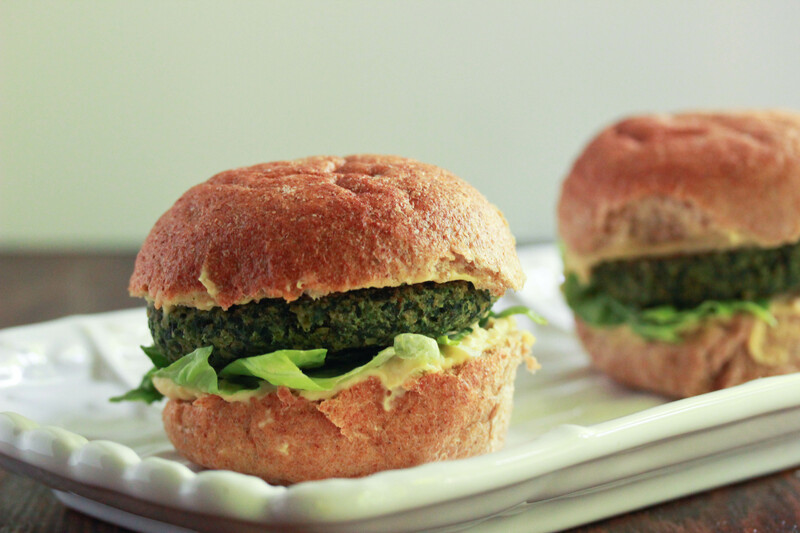 Remember how I made these awesome veggie burgers a while ago? Well so many people told me how they loved them, so I knew I had to make some more veggie burgers. Ever had an idea that buzzed around in your brain for what felt like forever, until you finally found the time to give it a try? Well that’s what happened to me with this recipe. The worst part is that it came out amazing, but now I am kicking myself for not bringing this into the world sooner. You just can’t win, ya know? Let’s discuss this recipe for a bit. 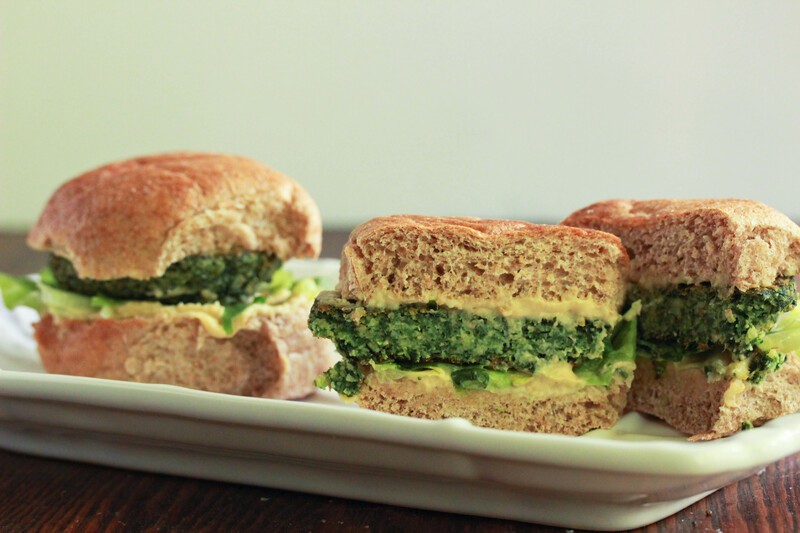 The idea that floated around the outer recesses of my brain for forever was “spinach and chick peas.” More specifically, I wanted to bake them into a patty, or perhaps fry them up as a nice little burger. I’m all about the chicken and meat, but for times when you want something lighter and healthier, or perhaps vegetarian, this is a must try recipe. It’s filling, healthy, pretty easy to make, and (this is totally important) looks really nice when you serve it. If those aren’t enough reasons to try these, I don’t know if I can help you. In the bowl of a food processor fitted with an “s” blade, puree the chick peas, spinach, eggs and oil until almost smooth, but still somewhat chunky. (A little texture will add a lot to the finished product.) Remove the mixture from the food processor and place in a small bowl. Add the breadcrumbs and spices and stir until evenly distributed. Heat a large non-stick skillet to low-medium heat. Spray well with cooking spray. Form small balls of the mixture and place on the frying pan. Press down a little bit to form a round, patty shape. Fry on low-medium heat for about 10-15 minutes, then turn over and fry on the other side. Important note: Spinach gets dark very easily, so to prevent these from getting black, fry over a very low flame. It will take longer than you might expect, but just leave it alone for 10 minutes and it will work really nicely. Serve warm, with hummus. Enjoy! These look fantastic. 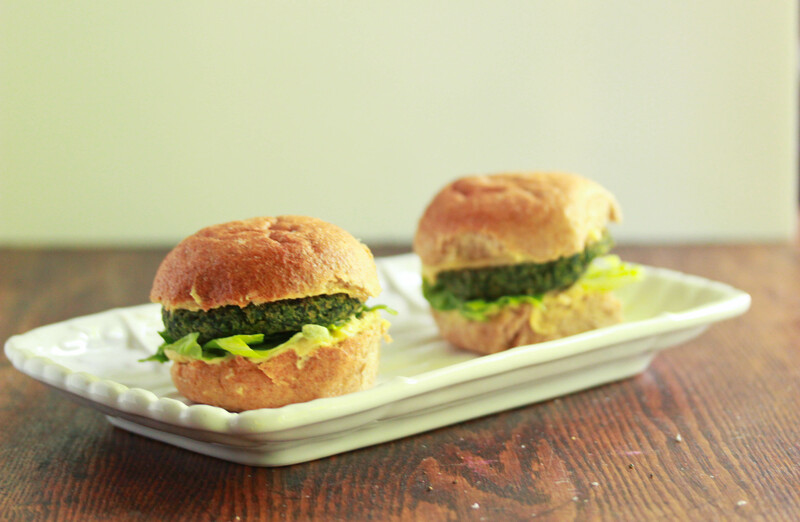 I am always looking for new veggie burger ideas. Thanks! I’m in vegetarian heaven at the sight of this!! Spinach is a great idea! Pretty foods just happened to be my favorite foods. how would it turn out with egg whites only? I made these tonight and they were great! I didnt have two cans of chick peas, so I subsituted with northern beans, also I added a drizzle of spicy mayo on top like the kind on sushi. My meat eating husband said he could eat them everynight! Can I use fresh spinach? How many ounces are in your chickpea can? Can these be baked? Frozen Bodek spinach ok? what size chick pea can?